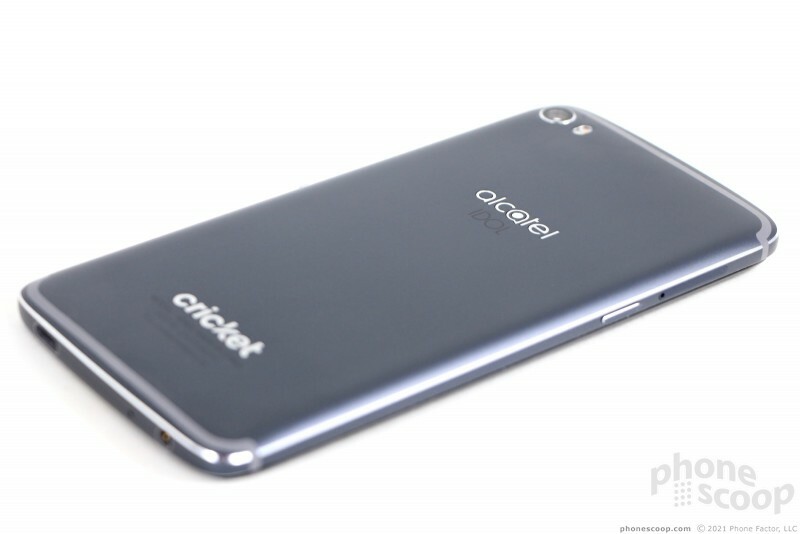 Alcatel's mid-range Idol 5 is a bargain for prepaid Cricket's subscribers. 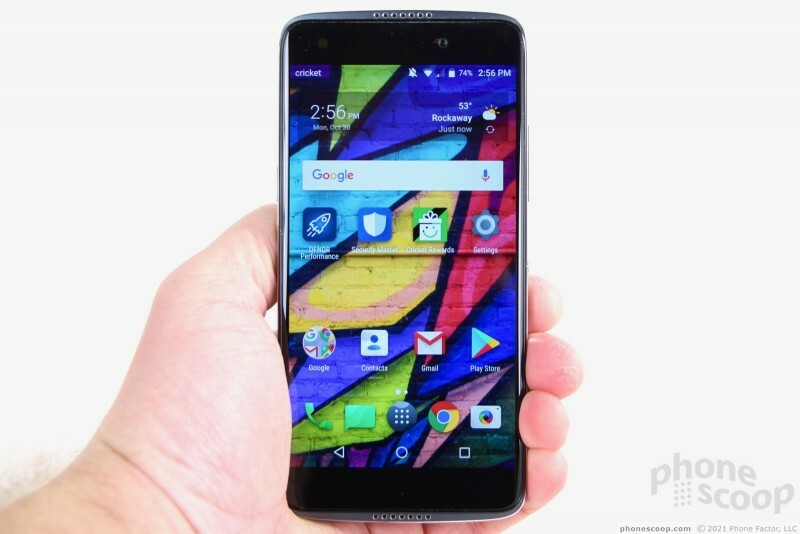 It combines an attractive metal-and-glass design with a near-stock version of Android Nougat and special features such as a customizable action key and stereo speakers. Here is Phone Scoop's in-depth report. The Idol 5 is Alcatel's 2017 affordable flagship handset. 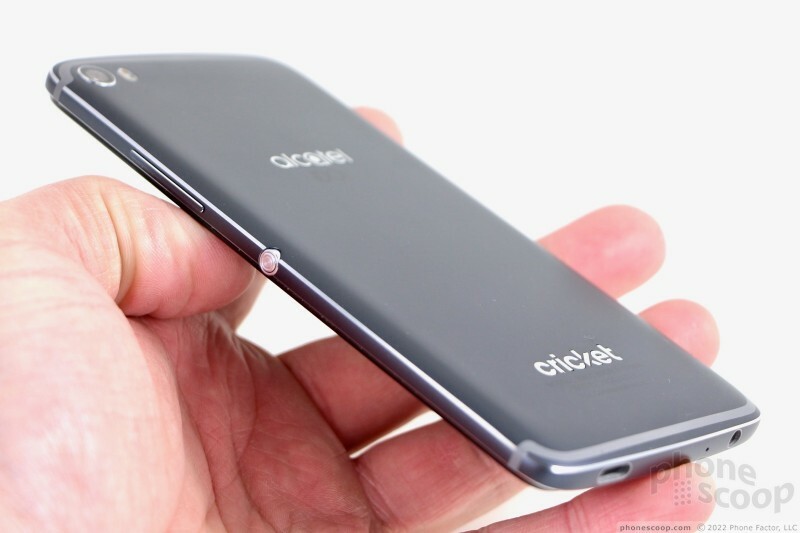 It's a well-designed, well-manufactured, mid-sized piece of hardware that delivers a simple Android experience. 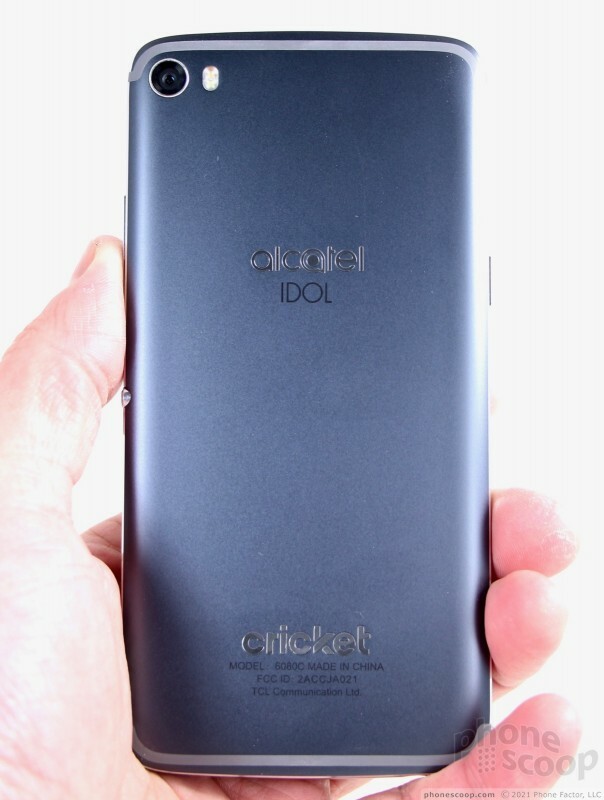 If you're a Cricket Wireless prepaid customer, the Idol 5 is a clear step-up from the plastic stuff that lines the entry-level shelves. The Alcatel Idol 5 carries over many of the basic design and hardware components we've seen on the Idol series since the 2015 Idol 3. The Idol 5 is a compelling handset that should appeal to people who want something better than low-end fare, but find an iPhone or Galaxy S too pricey. The Idol 5 offers a near-premium experience at less than one-third the cost of today's flagships. 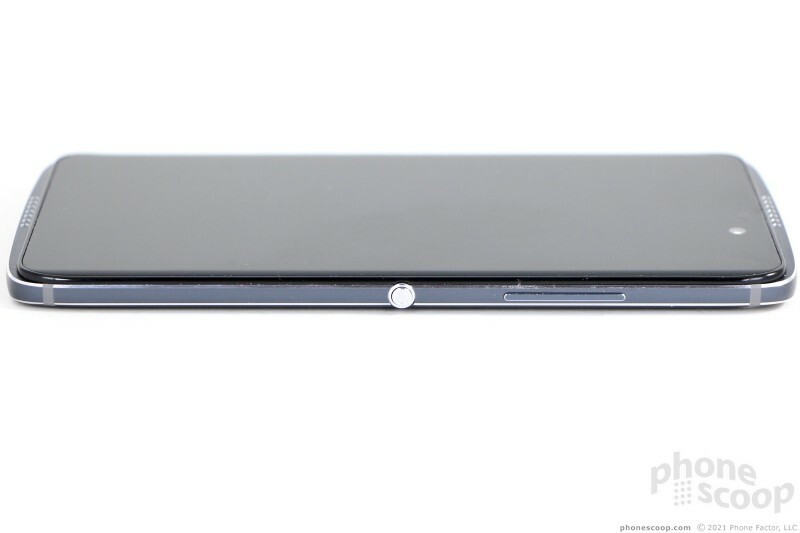 The phone is assembled from metal and glass components. Due to its shape and size, it almost looks like the front glass panel is resting on top of the metal chassis, as if it were a piece of fine cheese complementing a juicy hamburger. The metal chassis has a dark, metallic bluish-gray hue that I rather dig. The side edges of the metal chassis are chamfered so they produce a nice, chrome sheen. Chrome accents alight some buttons and other components to complete the classy, dressed-to-kill design. The surface of the rear curves just a bit as it reaches the side edges, helping reduce the footprint for better hand fit. 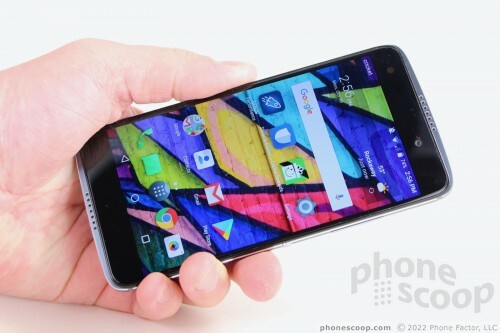 When compared to today's big-screened flagships, the Idol 5 looks downright compact. It is about the same size as the smaller iPhone 8 and Galaxy S8, just for the sake of comparison. It's a comfortable 5.83 inches tall by 2.83 inches wide. I really like the size, which is ideal for those with smaller hands. It's really easy to hold and use, as well as stuff into pockets. It's smooth enough that retrieving it from most pockets is no problem. Alcatel worked with fine materials in building this phone. The rear chassis feels strong. 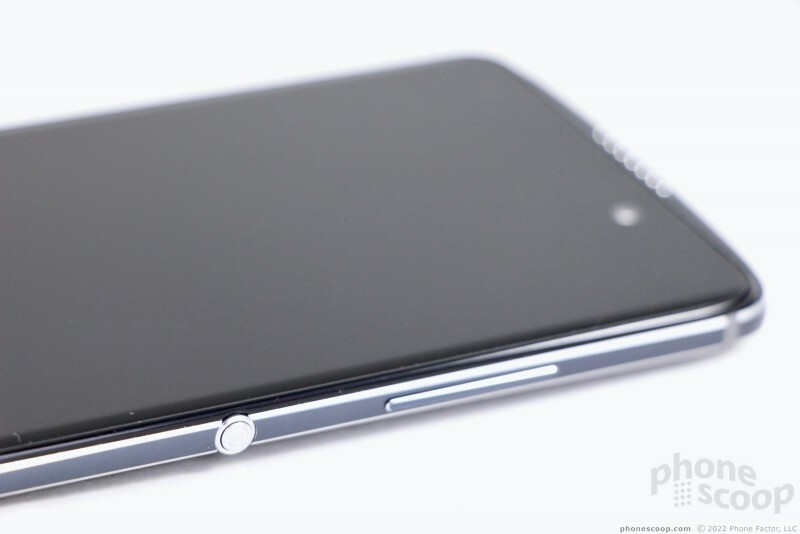 I like the weight of the metal, which is a single piece that wraps around and forms the sides of the phone. The top and bottom edges are bowed, which adds strength. The glass is Gorilla Glass 3; it may not be quite as strong as today's Gorilla Glass 5, but it should still be good enough to protect against most scratches, scrapes, and bumps. 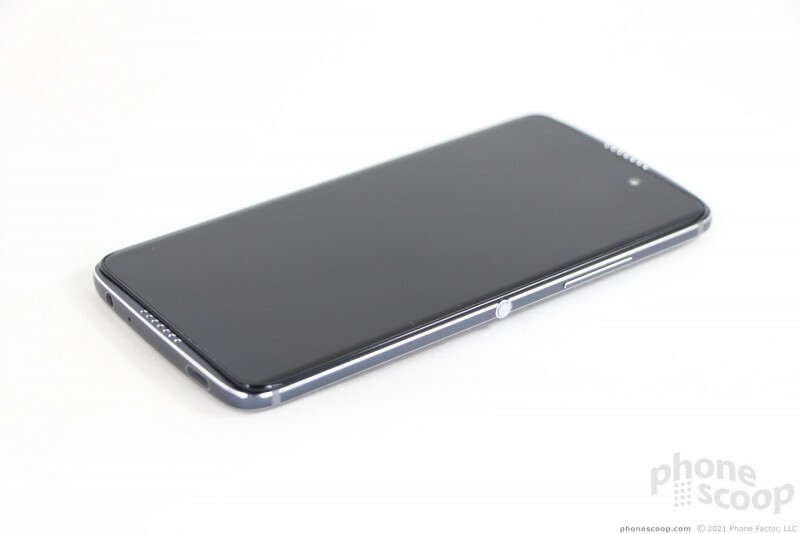 The Idol 5's face is nearly all black thanks to the glass panel that fills the majority. The glass stretches from side-to-side, but the metal framing extends a bit above and below the glass and contains the Idol's iconic stereo speakers. The speaker grilles are drilled into the metal frame and were left unpainted; this means they catch and reflect light, making them highly visible nearly all the time. 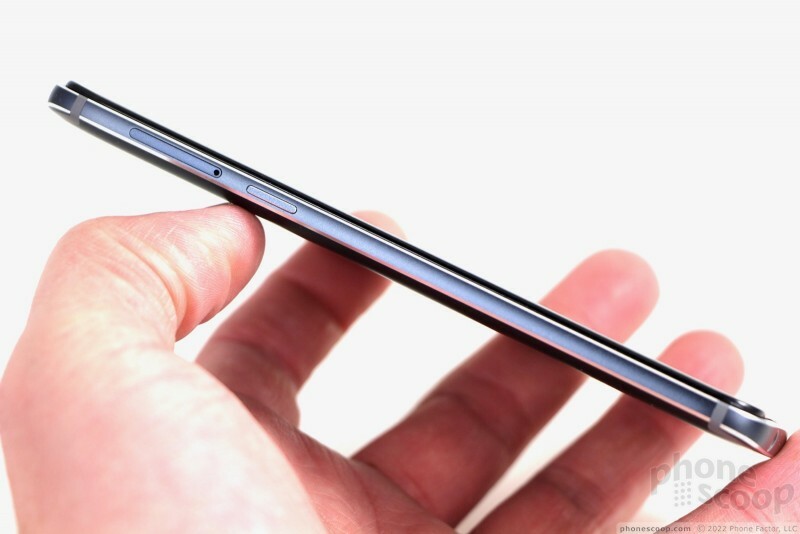 The glass itself has the slightest of curves where it fits into the slimmest plastic band. 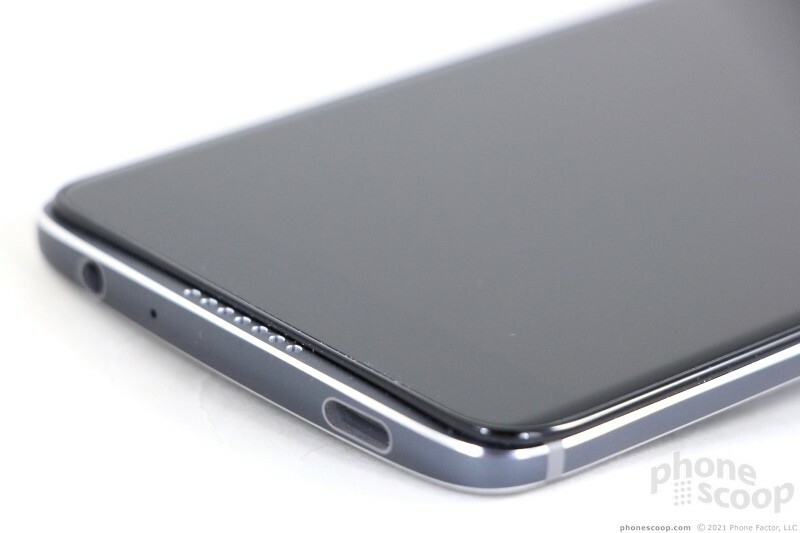 You'll find the screen lock button high on the left side of the phone, practically at the top. 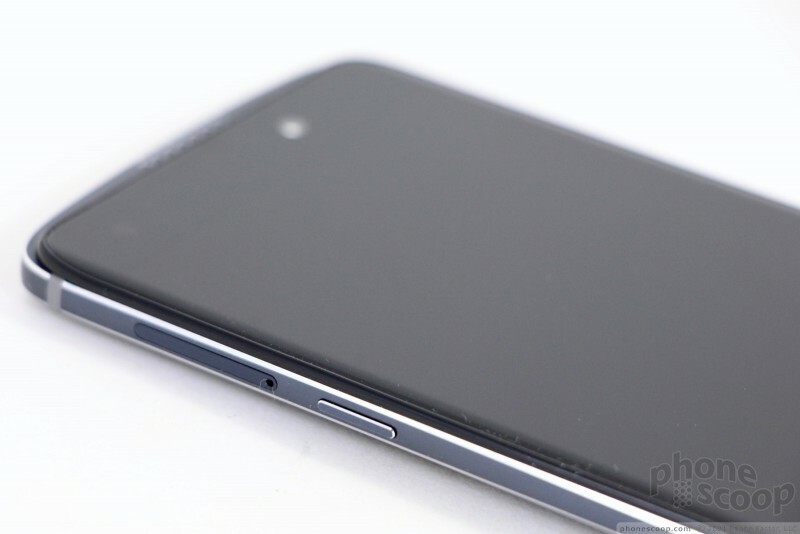 I prefer for the screen lock button to be on the right side and found the Idol 5's key hard to find and use. The button does have a good profile, and travel and feedback are pretty good. The volume toggle, positioned on the right edge of the phone, has a similar profile and travel and feedback. 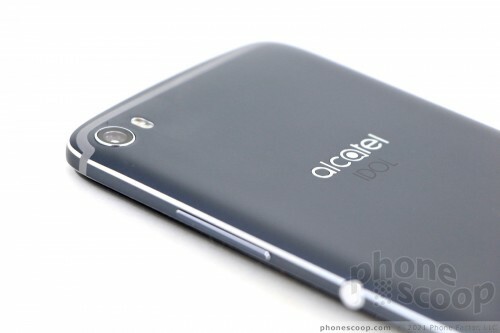 The Idol 5 carries over Alcatel's "Boom Key", now called the "Now Key". 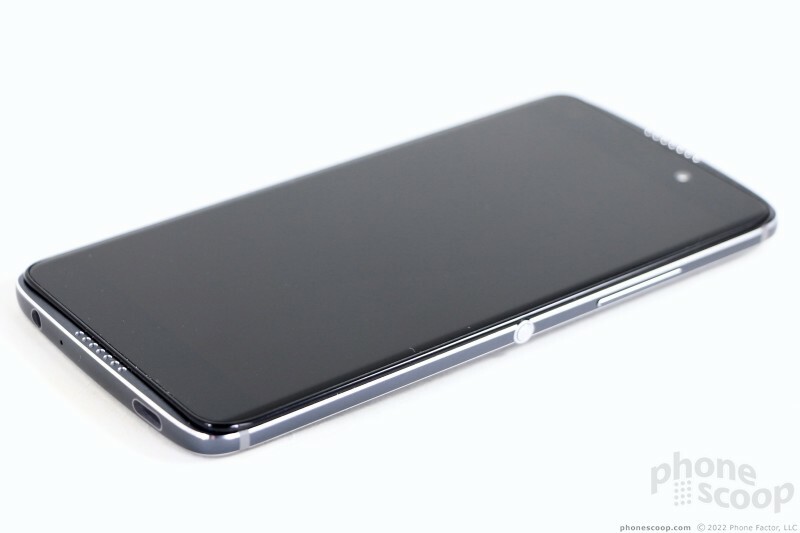 It's a round button placed smack in the middle of the right edge of the phone, right where the screen lock button should be. On the Idol 5, the Now Key can be configured to launch one of several apps. The button itself has an unmistakeable profile and perfect travel/feedback. 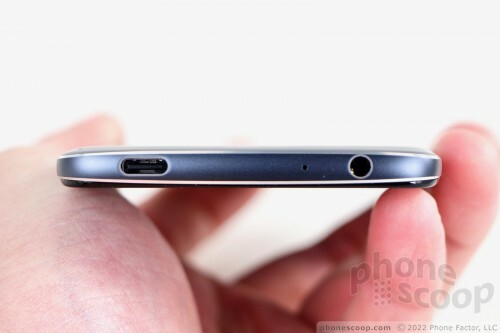 The combined SIM card / memory card tray is tucked into the left edge of the phone, while the stereo headphone jack is on the bottom, as is the USB-C port. The phone isn't water-resistant, nor rugged in any way. The back cover, pretty as it is with that nice metallic finish, cannot be removed. You won't be able to swap out batteries. The round camera module is located in the far upper left corner of the back side, with the two-tone flash close by. 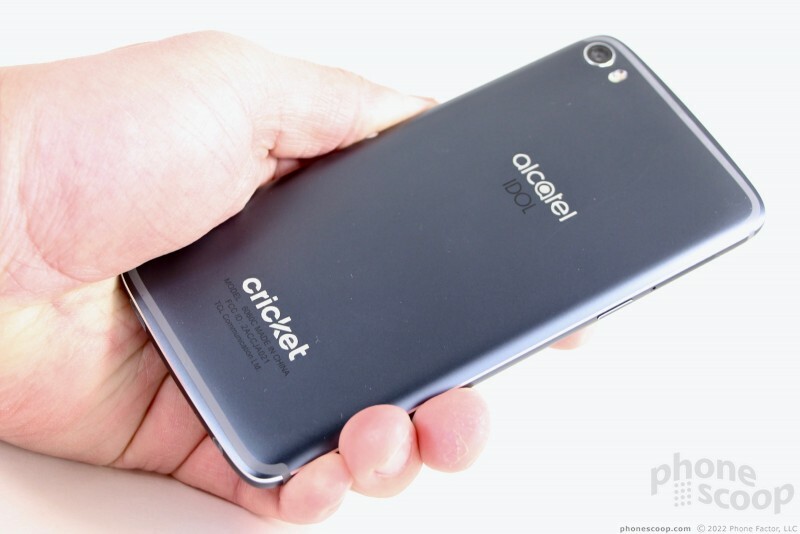 The Alcatel and Cricket logos are hard to miss. 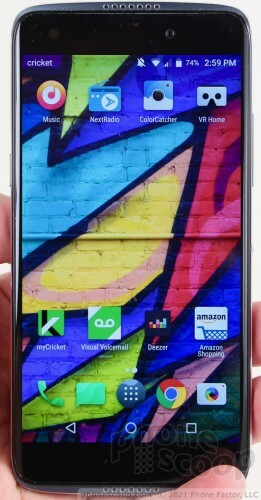 Alcatel did a fine job crafting this mid-sized marvel. It's a compact, attractive handset that offers an experience far above its price point. The 5.2-inch LCD panel offers full HD resolution. This is a great size/resolution combination, as it offers some 424 pixels per inch. It's incredibly sharp; individual pixels are entirely invisible. The screen is also bright, colorful, and accurate. The oleophobic coating on the glass does its job well, mostly keeping fingerprints and grime away. Even so, I found the screen succumbed to glare outdoors. Indoor visibility is fantastic, but it can be heard to see outside at times. 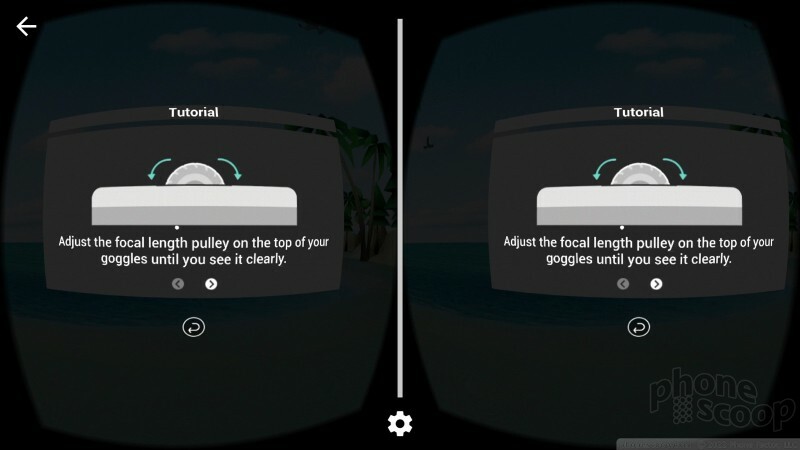 Viewing angles are good, with minimal change in brightness and no change in color. The LCD panel and HD resolution mean the Idol 5 is not the best VR candidate, but that hasn't stopped Alcatel from creating a special VR headset for the phone. 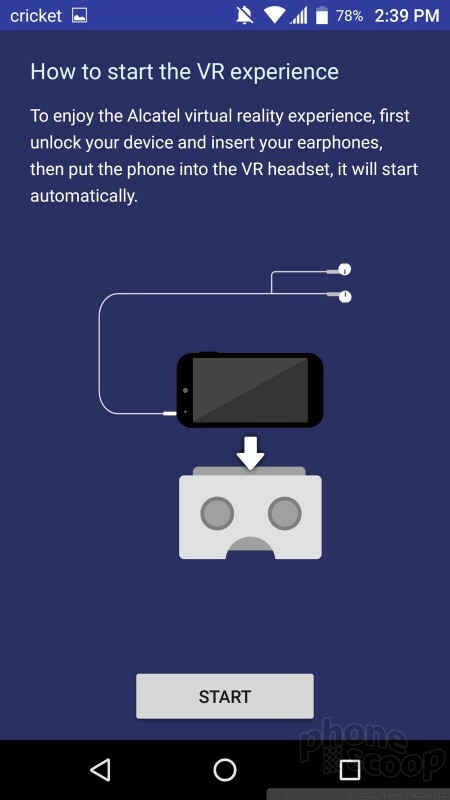 The UNI 360 Goggles, which are available separately, function a lot like Google Cardboard. 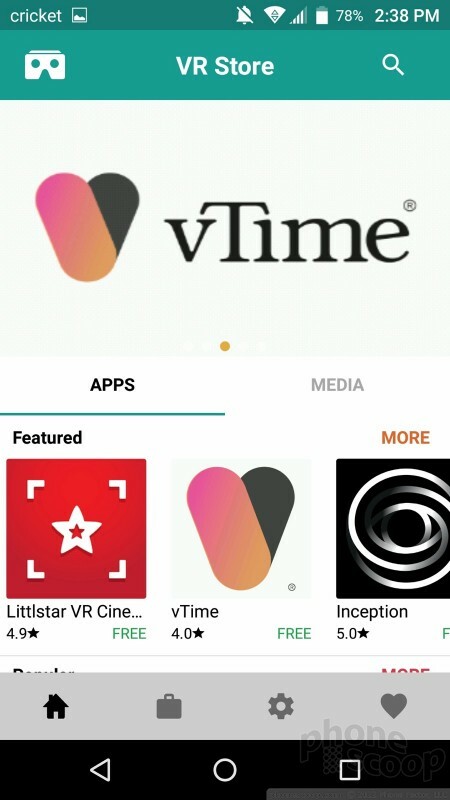 The phone comes with a single VR app called vTime. 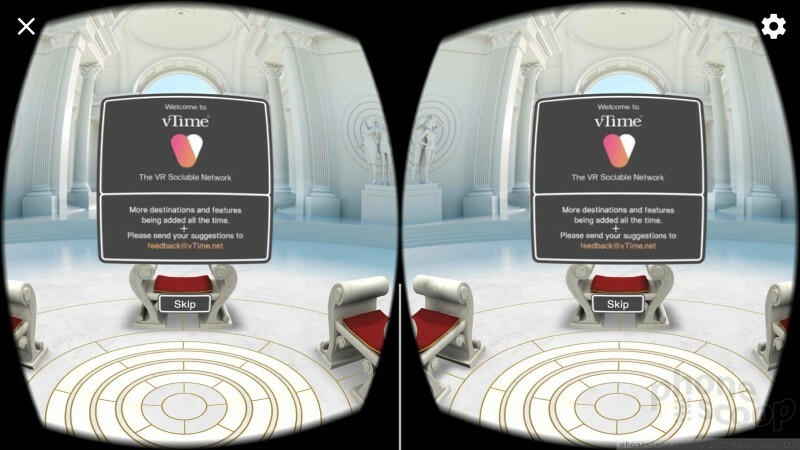 It runs pretty slowly, and there are lots of obvious pixels when viewing VR content through the viewer. 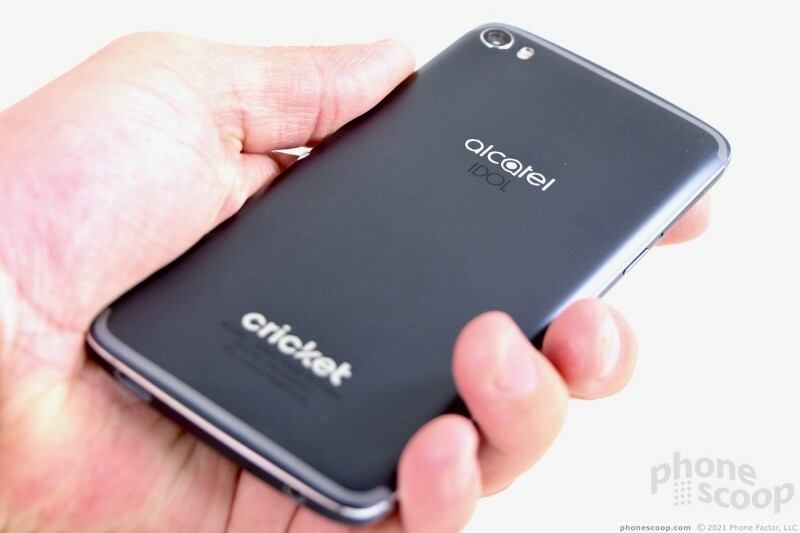 Cricket Wireless is owned and operated by AT&T, which means the Alcatel Idol 5 actually runs on AT&T's LTE 4G network. 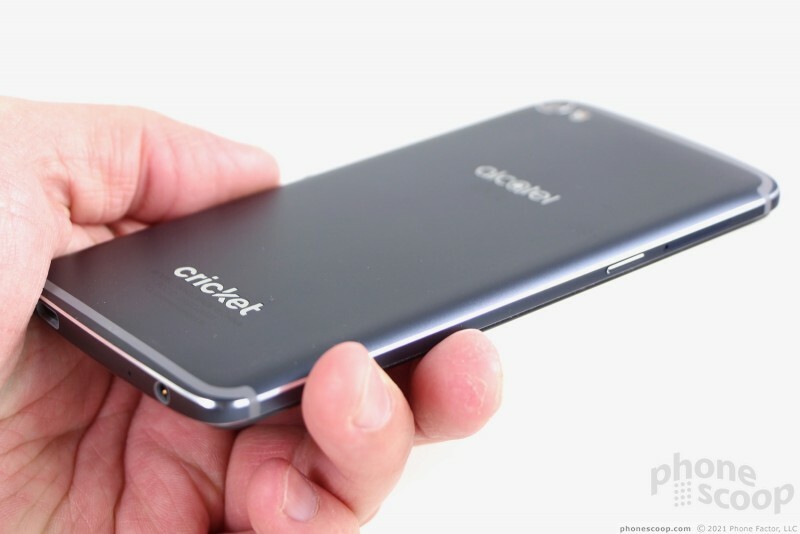 I tested it around the New York City metro area and found it performed on par with other Cricket-branded phones. 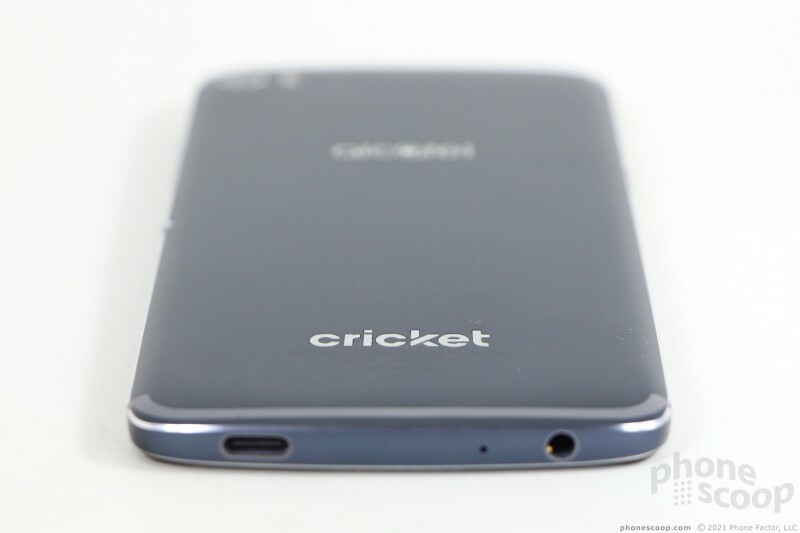 I'll remind Cricket customers once again that AT&T limits Cricket handsets to maximum mobile data speeds of 8 Mbps. With that in mind, the Idol 5 held onto AT&T's LTE network everywhere I took it, and was able to consistently hit those maximum speeds. 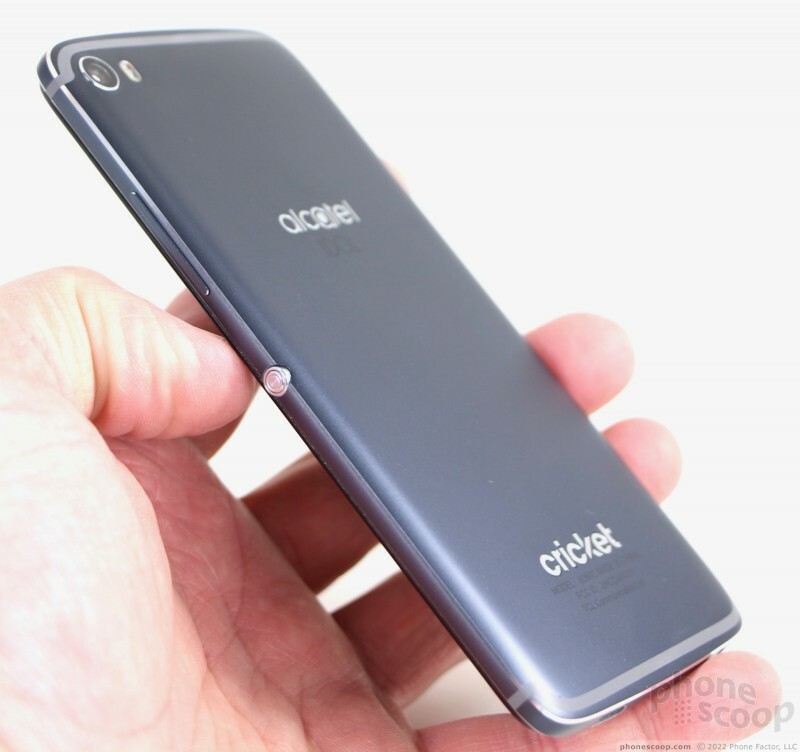 Bottom line: the Idol 5 performed as quickly as Cricket allows it to. I didn't run into any trouble streaming low-quality music over the network, but watching YouTube videos (even standard resolution) via LTE led to some buffering and waiting. Browsing the web and social media apps was mostly smooth. The phone connected nearly all calls on the first dial and dropped just one when in a moving car. 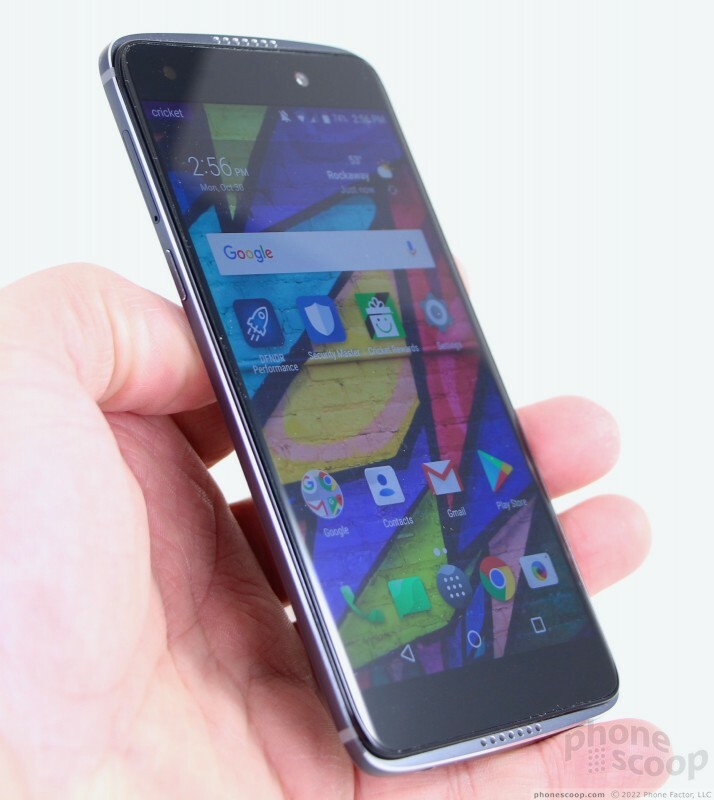 I'd rate the Alcatel Idol 5 a mediocre phone for holding conversations. The earpiece is neither as clear nor as loud as I want it to be, but it suffices on most occasions. For example, I had no trouble maintaining calls at home and in other quiet spaces, such as an office with a closed door. I had a harder time hearing calls in public spaces, such as coffee shops and city streets. Calls in the car were very hard to hear. The speaker was prone to distortion when set all the way up. People said I sounded "just okay" when I spoke to them via the Idol 5. The speakerphone delivers an equivalent performance. It's average in every way. You'll find it works well when you're in private spots, but it suffers when you're out in the world. It's really hard to hear in a moving vehicle, and cranking the volume introduces a lot of distortion. Ringers and alert tones managed to get my attention when necessary. Curiously, the stereo speakers, when used to blast music or watch YouTube videos, sound amazing. The phone's internal amplifiers do a good job delivering clear, full sound that's loud enough to fill a room with your favorite soundtrack. The Idol series has always boasted this feature, and the Idol 5 delivers the goods when it comes to personal entertainment. 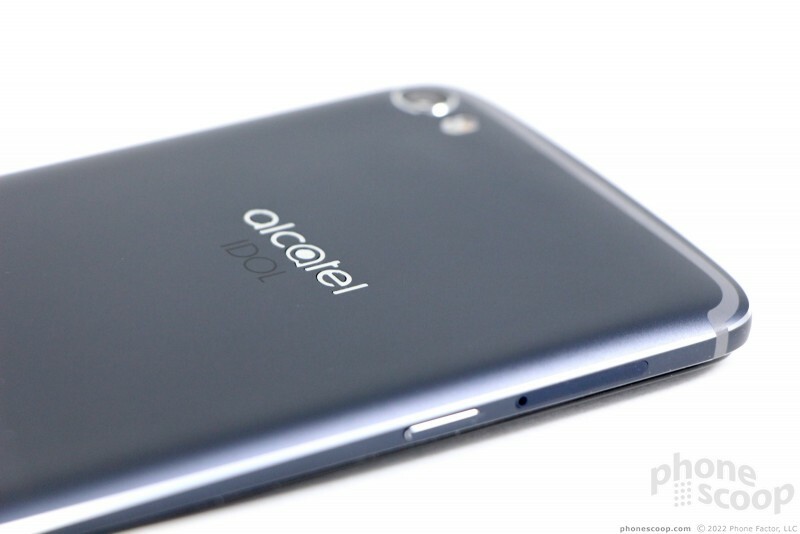 Alcatel put a mid-sized 2,850 mAh battery into the compact Idol 5. The phone can push through a single day, but it does come close to giving up the ghost by bedtime. I noticed the battery had dipped below 20% by the time I was ready to call it a day. More than once the phone was close to 10% at the end of the day after heavy use. You'll have to pay attention to the phone's battery life throughout the day, and I wish that weren't the case. The Idol 5 supports rapid charging and the included charger will power it up relatively quickly. 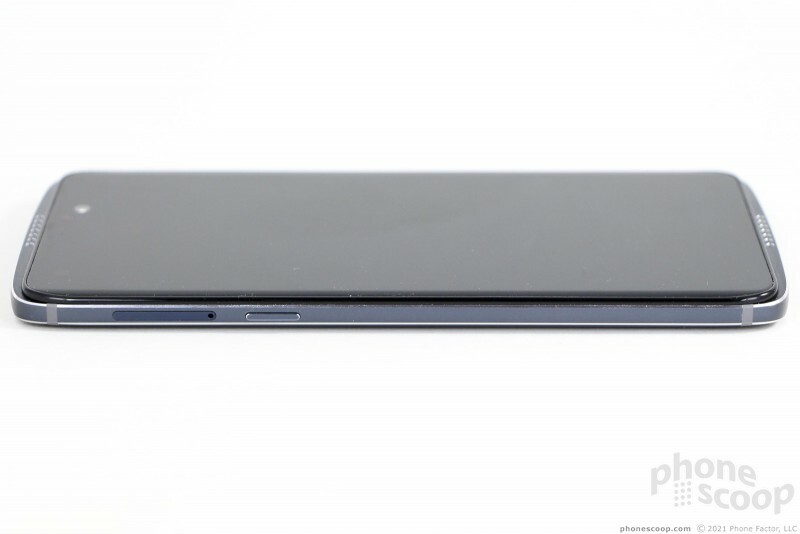 The phone does not support wireless charging due to the metal chassis. Bluetooth functions well enough. The phone paired with a range of Bluetooth accessories, including headsets, speakers, and my car. The device delivered average quality calls through headsets, but terrible call quality through my car's hands-free system. Music sounded decent via Bluetooth speakers, though in some cases you may be better served using the built-in sonic cannons. I had no trouble using the Idol 5's NFC radio. It supports Android Pay, and that's a good thing. Using Google Maps, the Idol 5 was able to field my general location in several seconds. It took closer to 10 seconds to truly lock down my exact location, and accuracy was never better than about 25 feet. That's pretty good, but I've seen better. Google Maps worked well enough as a real-time navigation tool, but it sometimes lagged my actual location when traveling at highway speeds.